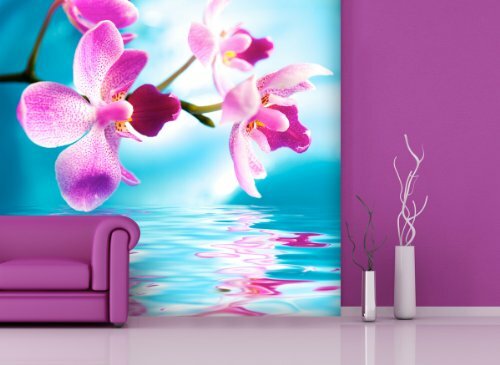 Non-woven wallpaper pink orchid in Various Sizes – A Choice Between Paper or Ecological – PVC-Free, Odourless, Latex Print Solvent-Free, Wallpaper with, Poster, Photo Wallpaper Mural, Mural for apportionments Theme. Wallpaper - (120g/m² wallpaper heavyweight matt). High transparent, white matt surface on to the light. The blue back it prevents the transparency of the background. Supplied with the material and instructions. Sheepskin Fabric Wallpaper - Heavy (130 g/m²). The easy paper walls in sheepskin Easy Paste with smooth surface, is resistant to light, tear-proof, dimensionally stable, fabric, PVC free and offers excellent coverage of the background. With the fabric of the fleece wallpaper is used the so-called technique of membership to wall. Not need soaking the wallpaper and the glue is applied directly on the wall and the wallpaper applied strip after strip. It removes without leaving any trace - Supplied with glue and instructions. The wallpaper in premium quality sheepskin fabric with smooth surface, is resistant to light, tear-resistant, dimensionsstabil, fabric, free of PVC and provides an excellent coverage of the background. The wallpaper is fire-resistant with certificate B1 according to DIN 4102 (Fire Protection).